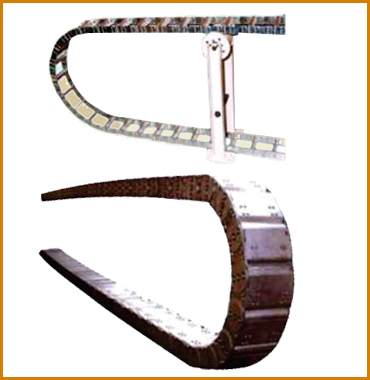 We are leading Cable Drag Chain, manufacturers, suppliers and exporters located in Ambarnath MIDC Dist Thane, Maharshtra India. Cable Drag Chains provides protection for supply cables or hoses & support them for smooth & sure movement on machine. Material of construction for each is galvanized steel.Stay bars are either non-metallic split types or tie-rod type. Mitool Make cable drag chains are used where energy has to be supplied from fixed point to mobile machine parts. Mitool make cable drag chains are so constructed that they cannot bend below a fixed minimum radius to suit the cable or hose. Mitool make cable drag chain are not only used for cable leads but also for hose conveying gaseous, liquid or pulverised media. Single twisted leads can be conducted close to one another. As a result frequent movement will have no effect on oil pressure nor will there be any breaks in the electrical current. Material of construction for each is in galvanised steel / SS-304 Steel. Staybars are in split type in aluminimum or in non metallic material. ( Opitonal Segment Type Cover ) Mitool Make cable drag chains with segment type covering are used where it is necessary to protect the cables/ hoses from hot chips and dust etc. At extra cost. (Optional Trough) To guarantee optimum operation of the Mitool Make Cable Drag Chain a clean flat surface should be provided. If this is not possible then a trough is required.